Tarzan's Magic Fountain was Lex Barker's first Tarzan film -- producer Sol Lesser interviewed more than 1,000 actors to replace Johnny Weissmuller in the role of Tarzan. 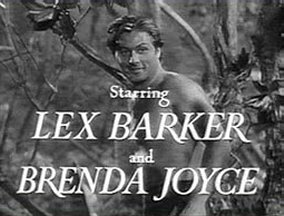 Barker turned out to be one of the better film Tarzans, even though Weissmuller was obviously a hard act to follow after his 16 years and 12 films at MGM and RKO studios. 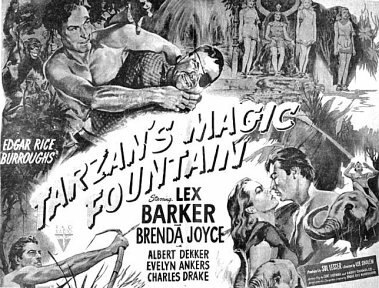 Magic Fountain is Brenda Joyce's last appearance as Jane (making her the only Jane ever to appear opposite two different Tarzans). The film is about yet another tribe of people hidden in the jungle somewhere. In their secret valley is a fountain of youth, which keeps a woman who crash landed in the jungle decades ago looking as young as she was when her plane went down. After she had returned to the outside world, word of the fountain leaked out and unscrupulous hunters are now trying to find and exploit it. 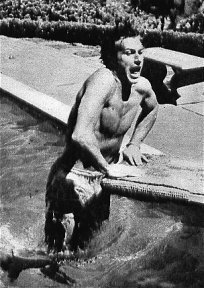 Tarzan tries to keep the hunters from finding the hidden valley of the fountain. The flyer ages as the effects of the fountain wear off -- a theme previously explored in James Hilton's Lost Horizon. 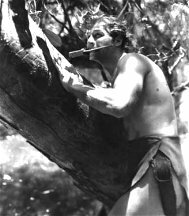 Elmo Lincoln, the original Tarzan from 1918's Tarzan of the Apes and a few silent film sequels has a cameo as a fisherman. 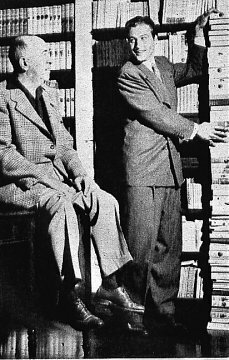 Wardrobe Supervisor: Frank Beetson Jr.
Lex examine a stack of Tarzan books. is in condition for role. 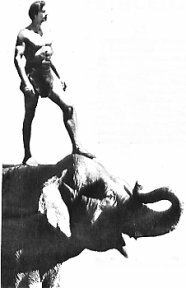 Here he attacks evil with Tarzan's accustomed vigor. 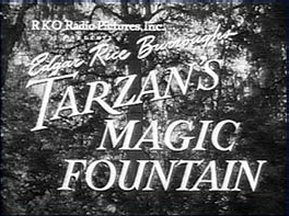 Tarzan's Magic Fountain, soon to be released is the twenty-fifth of a motion-picture series that began in 1918 with Elmo Lincoln as Tarzan. 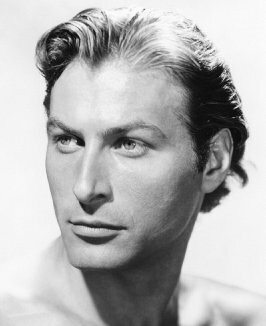 In it is an actor who should bring new polish to an old role, Alexander Crichlow Barker II (Lex Barker on the screen), the tenth and newest Tarzan, has a background that includes Phillips-Exeter Academy Princeton, New York society and the Broadway stage. A barrel-chested, six-foot-four 200-pounder, he even has the ability to memorize and deliver lines. 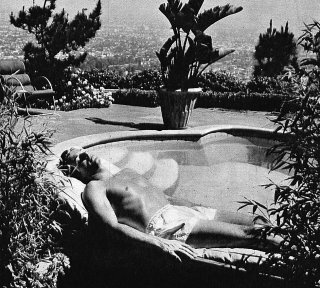 who also played opposite Weissmuller. to acquire, keep legendary Tarzan tan. 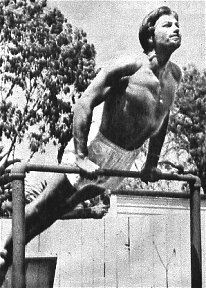 down to a Tarzan-like 200.
punching bag and many other exercises. 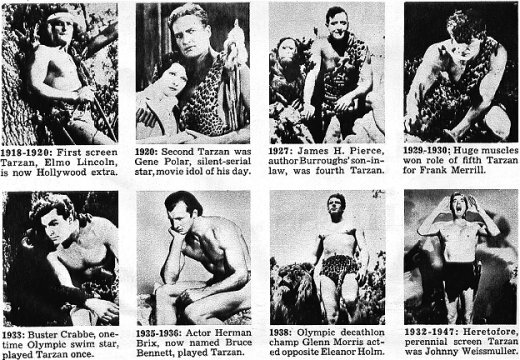 Tarzan chronology shows the series has been popular for 30 years, an all-time motion-picture record. Note: The photos above for Polar and Pierce have been switched. 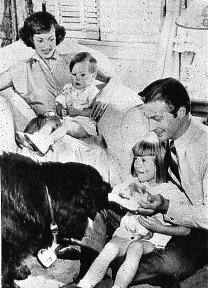 Also, Gene Polar was far from being a "silent-serial star" and "movie idol of his day." 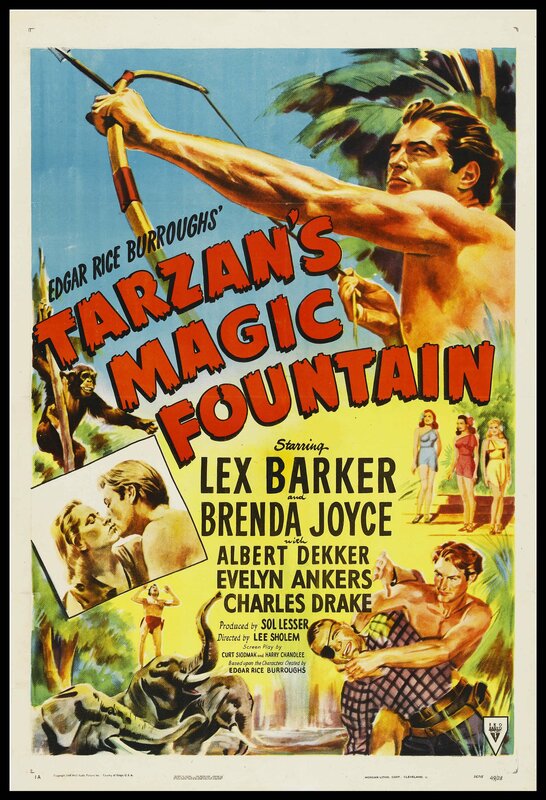 New York Times ~ February 7, 1949 ~ by H. H. T.
Johnny Weissmuller finally having swung down from his jungle throne of sixteen years, RKO is launching its new muscle king, Lex Barker, in "Tarzan's Magic Fountain," current at the Globe. And score one for Mr. Barker. A younger, more streamlined apeman with a personable grin and a torso guaranteed to make any lion cringe, he seems to be just what the witch-doctor ordered for this tattered series. The picture, though, is a matter of stale peanuts at the same old jungle stand. Instead of resorting to new ideas and treatment and a timely overhauling job, the studio has dragged out a mouldy script, the same sheepish-looking extras, and the wheezing chimpanzee, Cheetah, who isn't getting any younger, either. Not even the props have been spruced up, from the cardboard mountain ranges to the studio's backyard underbrush. And the theme, if you missed the last four or five in the series, is still white man's greed disrupting the serenity of the jungle where Tarzan presides from his tree roost. This time the invaders are led by an English aviatrix, nicely played by Evelyn Ankers, who is seeking a hidden valley where she had lived for twenty years, imbibing from a youth-retaining fountain. Albert Dekker and Charles Drake, the culprits, are all for turning the valley inside out and commercializing the natives right into the next world. 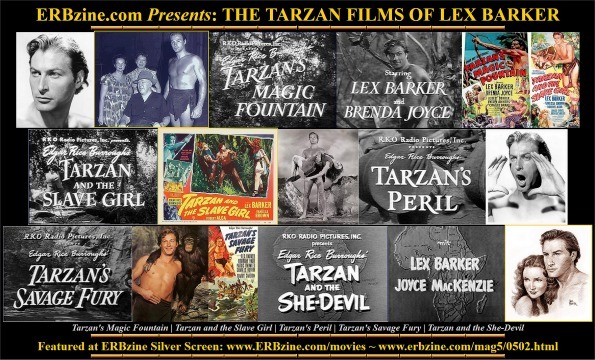 Of course, Tarzan is just the boy to put a stop to that sort of thing. And for our money, the Barker brand of heave-ho is the only asset to the whole tired, silly shenanigans. We wish him luck. 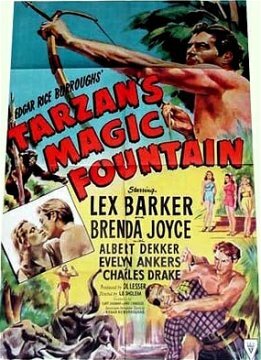 If "Tarzan's Magic Fountain" is the shape of jungles to come, he's certainly going to need it.